"Out of the System" is only $15.00CAN plus taxes and mailing costs! 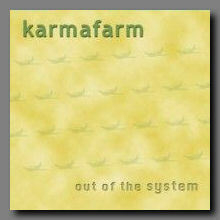 Karmafarm "Out of the System"
The debut solo release by Steven Sauve of Sylken and quasiMODAL. Fans of the Toronto ambient scene will no doubt be familiar with the name of Steven Sauve, one of Eric Hopper's frequent collaborators in the Sylken project and a member of quasiMODAL. One may not however be as familiar with his solo work as Karmafarm, a systems based ambient project Steven has performed under for a number of years. "Out of the System" is the first CD release by Karmafarm and it fully captures the charm and dark wonder of Steven's work. "Roads into Ruins" is a rather ominous opening track, a lonely trip into the heart of darkness. Deep drones play against the noises of industry, the sounds of ancient machinery revived from dormancy to transport us to another place. A marvelous piece to introduce the disc, simply stunning. "Opulent Revision" treads a similar dark path, tones rising and falling against a constantly shifting backdrop of sounds. "Land of Sleep" plays with the soundfield, alien whirring and buzzing sounds flying around the listener, an almost insectile grace about them. Quite beguiling this one. "Leipzig Unseen" presents an arctic wind blowing through the frozen Tundra. Pads sweep throughout the track alternately growing and shrinking in volume, the progress of movement measured in slowly oscilating tones. Brilliant. "Bamboo Shift" takes a complete one eighty and brings us out of the darkness for a few moments with some lovely echoing keyboard work over a number of rather exotic percussive tones. Charming. "Procession" returns to the darker tones of the earlier tracks, creating a sense of majesty and ritual with pulsing tones keeping time with a series of ascending melodies. Very theatrical this one, something very regal about it. "Psyko:logik" continues the journey through the dark with the sound of the abyss portrayed by the slow pulse of processed sound. Chilling and enigmatic tones pass throughout adding to the atmosphere. Truly inspired dark ambience. "Out of the Blue" closes the disc with an oscilating drone blended with found melodies and distorted sounds. A sense of departure is apparent in this work, a feeling of night's gradual ebb and the dawning of a new day. I'm most impressed with "Out of the System", the sense of movement and atmosphere capture herein stand with some of my favorite pieces in the genre. I wholeheartedly recommend this release and eagerly look forward to future work from Karmafarm.